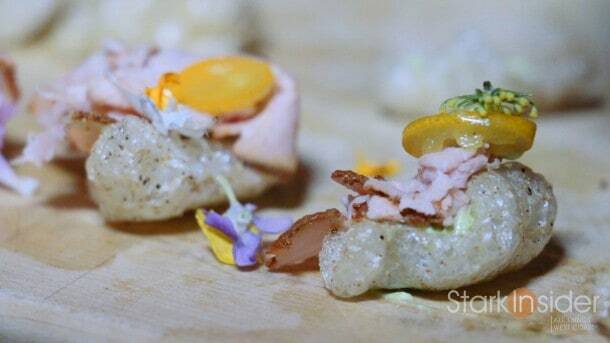 We go snout to tail as Cochon 555 serves up a heritage pig extravaganza. In this episode: Chefs Cindy Pawlcyn, Kelly McCown, Jason Kupper, Patrick Clark, and Dustin Valette do pork battle royale. Cochon 555 swung into town and I couldn’t resist dropping in to take a look. Once again 5 talented chefs were taking their culinary creativity to extremes, and delighting fans in the grand barrel room at the Culinary Institute of America. 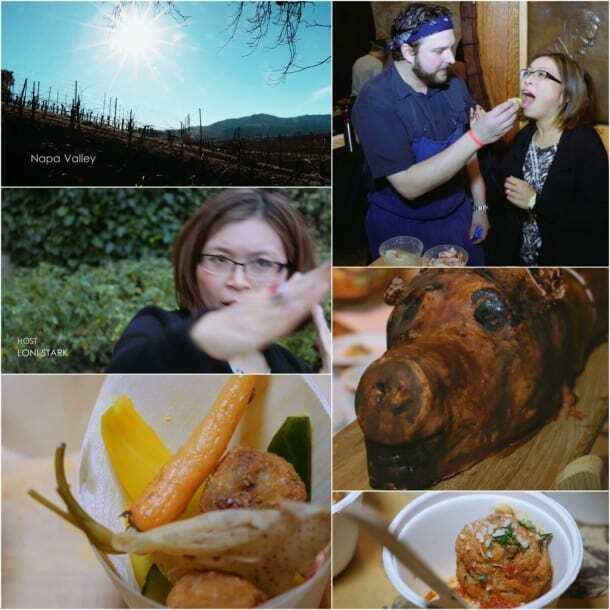 This year’s edition in Napa Valley featured Chefs Kelly McCown (Goose & Gander), Jason Kupper (The Thomas), Patrick Clark (CIA at Greystone), Cindy Pawlcyn (Mustards Kitchen) and Dustin Valette (Dry Creek Kitchen). And, as I finally figured out (after several takes as seen in the video below), there was also 5 pigs, and 5 winemakers on hand. It’s Napa, you just knew there had to be wine as well, right? Dave the Butcher was once again putting on quite the show, as he and his team went to work on the main stage. 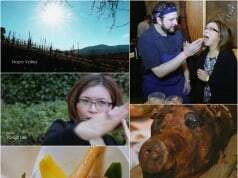 Cochon 555 honors the entire animal, from snout to tail – so nothing goes to waste. And, the big question: How were the dishes? Chef Cindy Pawlcyn (who I finally got to meet after all these years), was serving up several temptations including delectable “unrefusable” spicy Sicilian meatballs. They were topped with creamy polenta and tossed “pig-noli.” My faithful cameraman Clint can attest to the scrumptiousness that was Cindy’s pokstrami rueben (sauerkraut, gruyere, drunk Russian dressing). 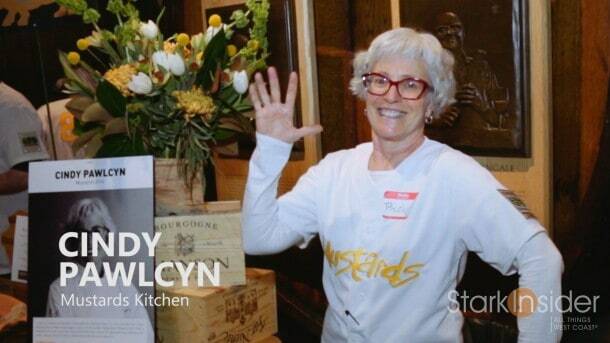 Chef Kelly McCown had an interesting, global perspective on the proceedings. His dishes were influenced by Lebanon, Jordan, Syria, and Israel. But instead of using goat or mutton, he used–you guessed it!–pork. His crispy head cheese was one of my favorites. Next up: Chef Jason Kupper. Chef was initially ever so polite. So I prodded him, and was ever so fortunate to get the awesome trash talking–“I got the swine!”–delivered with must gusto in the video. 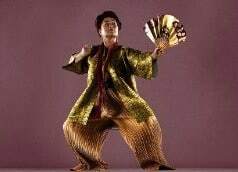 Artful is how I’d describe his presentations. Whimsical trotter tots (garden pickled vegetable crudite) were particularly enticing. For the pork fiends, his Green Chile Braised Shoulder (acorn grits, tomatillo relish, pig skin) seemed to be doing the trick. For Chef Patrick “where the hoof meets the pavement” Clark (from the Culinary Institute) it was all about the corn dog. “The best corn dog on the planet,” he tells me in understated fashion. A signature dish, I was astounded at its (sinful, no doubt) flavor. Also on offer, a bevy of delights: cheesy poofs (pig skin), mini hoagies (shoulder/leg/liver), sopes (shoulder/leg), pork buns (belly), and cheesecake (fat/shoulder). Heritage breed pigs graze in open pastures, which help keep our ecosystem healthy. Large Black hogs are named “large” because they can reach weights upwards of 700 pounds or more. Most popular heritage breeds: Berkshire, Red Wattle, Mangalitsa “Wooly Pig”, Tamworth, Duroc, Large Black, Yorkshire, Hampshire, Ossabaw, Gloucestershire Old Spot, Mulefoot, Kune Kune. The Duroc breed first gained national recognition at the 1893 Chicago World’s Fair. Low and slow: the best way to cook heritage pork. What should I drink with my pork? 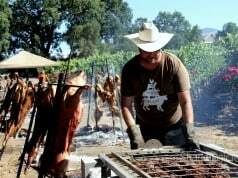 According to Cochon organizers, all pork has a sweetness and lightness that pairs best with light-to-medium bodies wines with lots of fruit and low tannins – for example, Pinot Noir. The first thing I learned about Chef Dustin Valette is that before he’ll do an on-camera interview he’ll insist on doing a mojito shot. 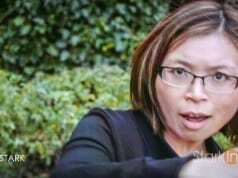 Oh, and he’ll insist you do one too. 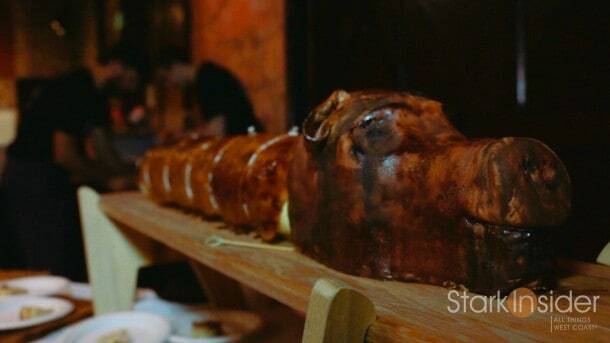 As you’ll see in the video he had an interesting pig contraption on hand to serve them up. On the food front one of the dishes he was serving was shiitake style ham sliders. Tempting enough. But Chef took it a step further. Instead of butter he used lard. And the whole thing is dressed with bacon fat mayonnaise. Oh, Cochon 555, my sentence is seven days straight on the elliptical. Note: the pigs did not make me cry as you might suspect after watching this video… it was a certain someone who will remain unnamed (Clint Stark). 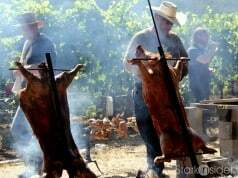 Getting Piggy at COCHON 555 in Napa Valley from Stark Insider on Vimeo.